As a bike enthusiasts we love to read about initiatives to improve and expand the cycling community. What they are going to build in Berlin is such a great idea. This could also be a perfect fit for in for example Melbourne or Amsterdam. For years now urban cycling in Europe is getting more and more popular, but not all cities are that bike friendly. While one of the best cities to bike in is Copenhagen, Berlin on the other hand continues to fall behind in this aspect. 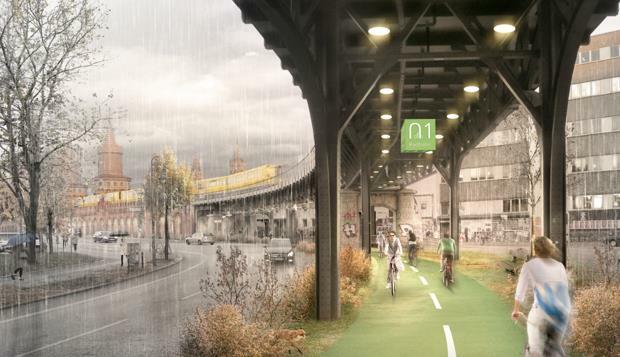 To change their current predicament a Finnish architect by the name of Martti Mela proposed to build a huge bike lane under a street level subway bridge, that will run through the heart of Berlin. With this bike lane you can bike from east Berlin to west Berlin in a straight line, without any cars hindering you. We hope there will be many more cool ideas like these to improve cycling throughout Europe. The top 5 biking routes in Europe, rated by Lekker.